I know I should be objective, casting a critical eye over proceedings. I should be open minded, impartial and unbiased, but I have to admit to being none of those things as far as the Nederlands Dans Theater is concerned. I luv ‘em. So last night, along with the great, the good, and the glamourous, I turned up at the Zuiderstrand Theater in The Hague for the start of NDT1’s new season – something not to be missed. Saisonnier, as the programme was aptly called, has been keenly anticipated, containing as it does, two brand-new works. But first up was a reprise of one of last year’s hits, Singulière Odyssée. As the house lights dimmed we heard a train passing in the distance and as the curtain rose we found ourselves in a vast, empty room, a waiting room made even larger by false perspective and the Zuiderstrand’s huge stage. 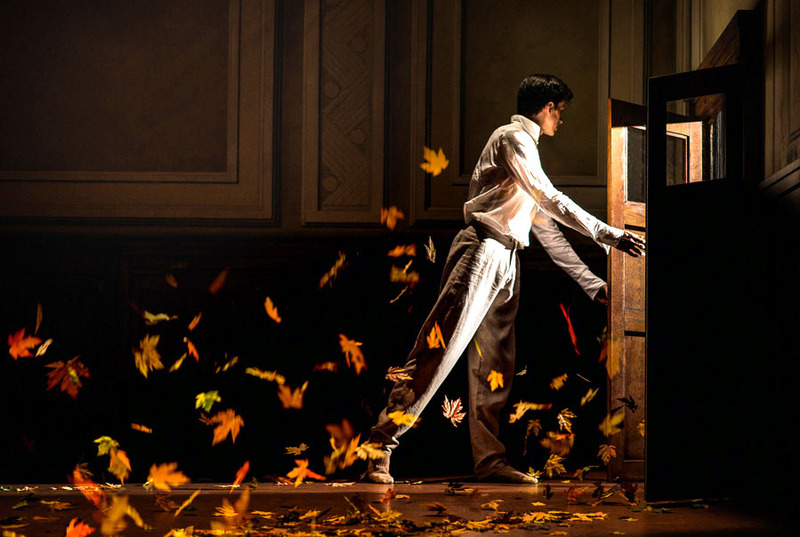 The wood panelled room, based on the actual waiting room at Basel’s Central Station, provided the environment and metaphor for in-house choreographers Sol León and Paul Lightfoot to explore the everlasting state of flux of the human condition. The travellers, beautifully costumed in pastel greys and browns, drift in and out with varying degrees of urgency, the only constant being the porter in his brass-buttoned, black uniform. As people come and go, he is the one who always remains. Danced to Exiles by Max Richter (where would contemporary dance be without him?) all aspect of Singulière Odyssée were sublime. The final moments, when leaves start blowing in through one of the doors on a shaft of light and then start falling relentlessly from above until the stage was ankle-deep in dry foliage, was beautiful. At the end, all the passengers have gone and the man in black is left alone among the leaves. A waiting-room represents the definitive state of limbo, the difference between staying and going – rather like life itself, except that the waiting-room has no past. The opening of Marco Goecke’s brand-new Walk the Demon was breath-taking. The curtain rose to reveal the stage filled with a cloud. A cloud, a real cloud, I kid you not. And it was clouds, or at least smoke, that was to define this piece, that and the ever-changing oval of light that delineated the playing area. But it was the visuals that dominated. I have never seen smoke presented and so cleverly manipulated as in Walk the Demon. It was, at times biblical, or, at the very least Wagnerian. The second première and final piece of the evening was, although a very large ensemble piece, very much a one-man show, a show choreographed, composed and designed by Hofesh Shechter. For Vladimir we found ourselves on some very mean streets. This was all torn T-shirts and track-suit bottoms as two gangs fought it out for supremacy. The energetic, frenetic even, dancing was superb with echoes of Jerome Robbins, a sort of West Side without the Story. The music, mainly percussive, was equally aggressive, supplied by Slagwerk Den Haag and a row of double basses from Het Ballet Orkest. I have to say, it really is a treat to have predominantly live music for a contemporary dance programme. Special mention for Vladamir must also go to lighting designer Tom Visser whose ever changing kaleidoscope always enhanced and often created the belligerent atmosphere. All in all, and predictably, a superb evening of dance from NDT1. There you are, I told you so. I am the adoring fan for whom the Nederlands Dans Theater can do no wrong. Brilliant. Saisonnier will be performed in The Hague, Amsterdam, Leeuwarden, Maastricht, Nijmegen, Rotterdam and Utrecht.